Late last week, we passed under the Golden Gate Bridge and cruised south to our new temporary home at impressive Westpoint Harbor Marina. 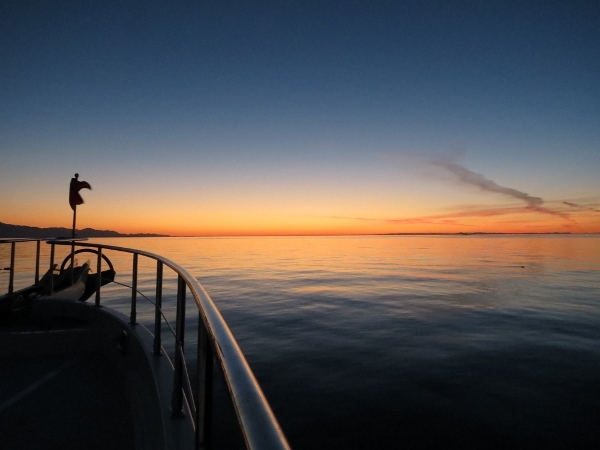 The trip from Seattle started out with wonderfully calm conditions through the Strait of Juan de Fuca–amongst the best we’ve experienced there. 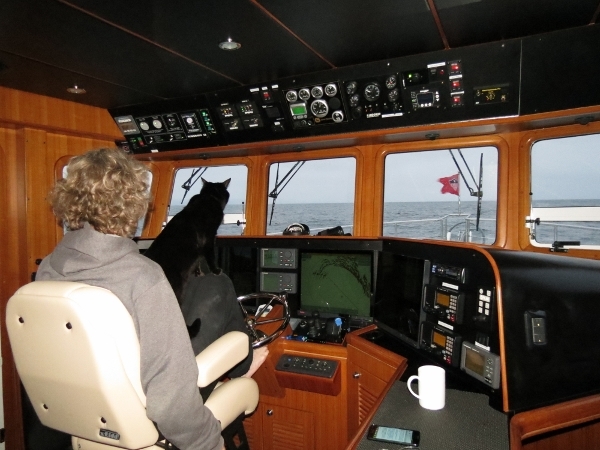 We originally had planned to run a good 50 miles offshore to avoid boat traffic and crab pots. But a storm was brewing with gale-force winds and 14-foot seas predicted between 60 and 250 miles offshore, so we instead ran within 10 miles of shore where better conditions were predicted. The winds still were 30-knot with 12-foot seas, but that was an improvement over the alternative. 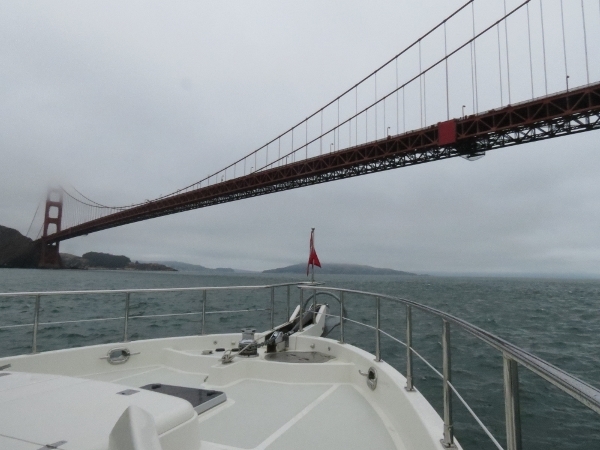 After about 24 hours of big winds, conditions settled back down and we had a relaxing cruise into the San Francisco area. 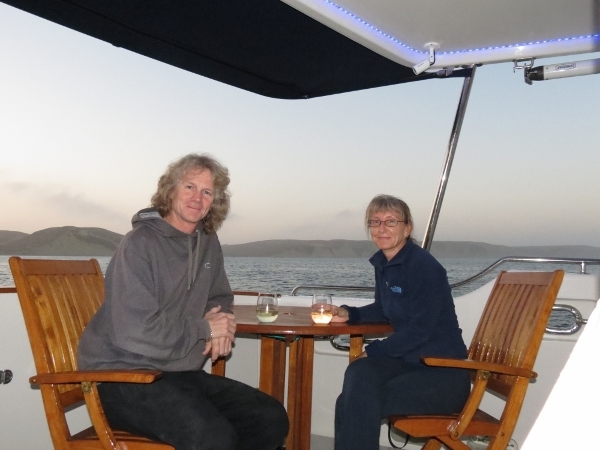 To avoid entering the busy San Francisco Bay in the dark, we anchored for a night at Drakes Bay. We had both navigation reasons for delaying our entry, in addition to better photo opportunities. We’d have to first cross the San Francisco bar, best done at slack or on a flood current. During large ebbs, the current there can reach 6 knots. And when ocean storms are pushing waves westward in the opposite direction, steep 20′ seas can develop there. 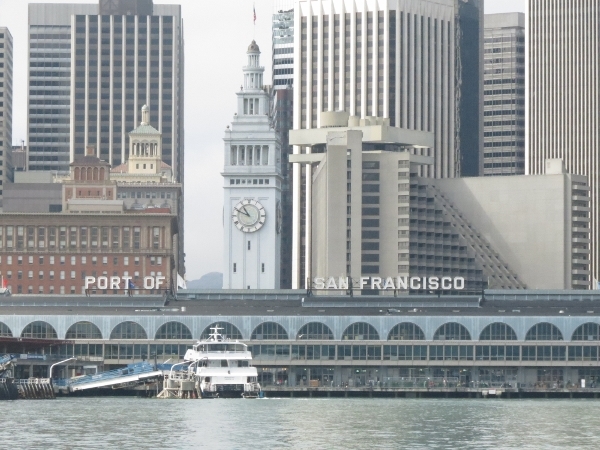 Once across the bar, Golden Gate itself is only 0.7 miles across and busy with ship traffic. 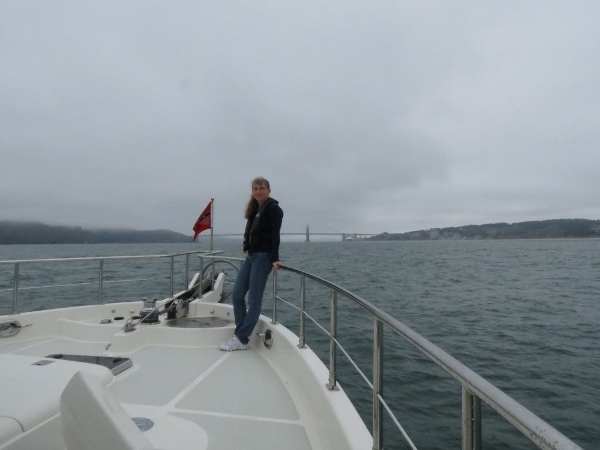 We enjoyed the stop at Drakes Bay–steep hills surround the anchorage on three sides, with a view south towards San Francisco. And the entire peninsula forms the Point Reyes National Seashore. 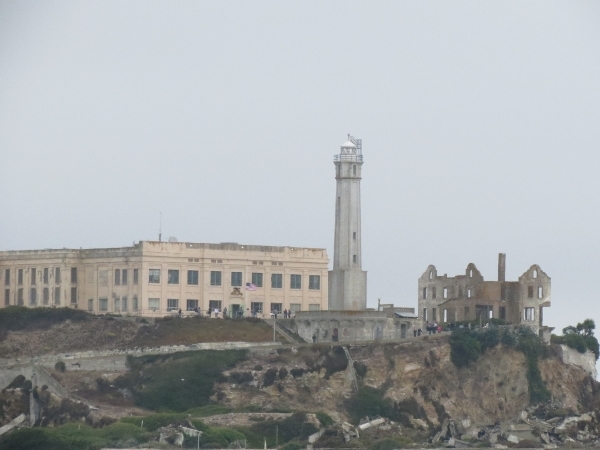 Had we not been so eager to reach our destination, we likely would have spent some time exploring ashore, particularly visiting the Point Reyes Lighthouse we’d passed on our way into the bay. But eager to arrive we were, so we left Drakes Bay early the next morning and arrived at the San Francisco bar about an hour before high-water slack. 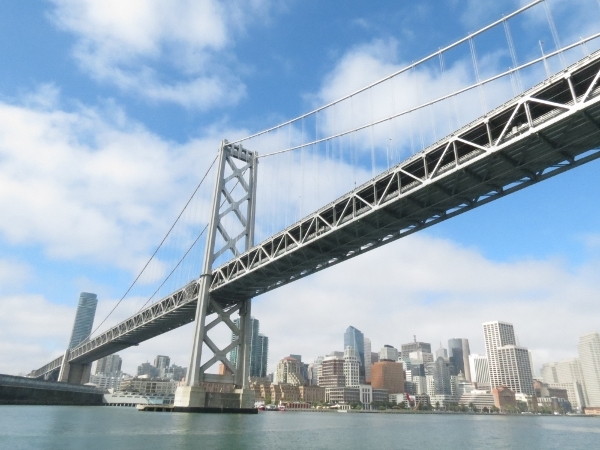 We had an easy cruise under the bridge, past the city, and south through the Bay. We’ll be spending the next few weeks here exploring the area, before continuing on to Hawaii. Our log for the trip is below. 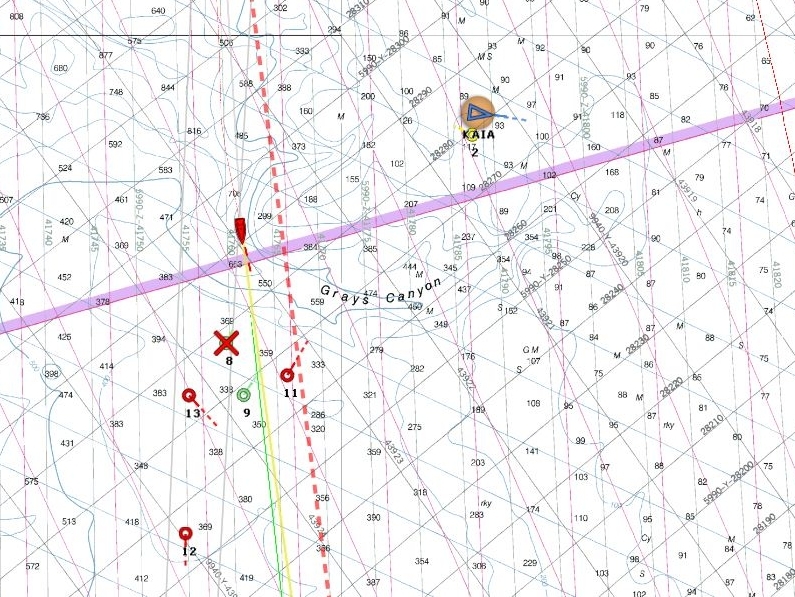 You also can display these, along with a detailed route, on the map view. We’re at the east entrance of the Strait of Juan de Fuca. 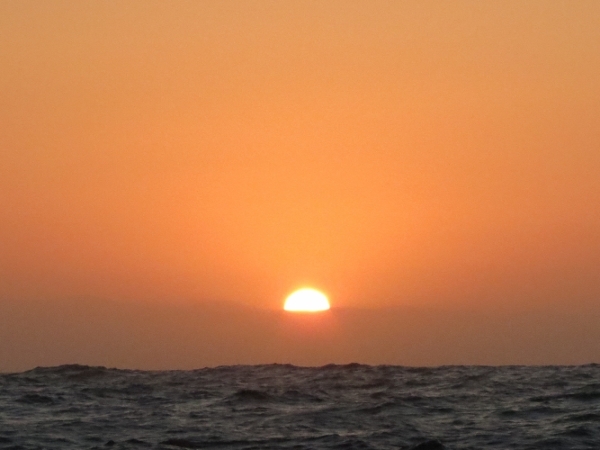 Conditions are excellent: 6 knots of wind, calms seas and clear skies. The cruise ship Amsterdam just passed heading to Alaska and still is visible in the distance, aglow with light. Conditions in the strait stayed wonderfully calm the entire time. We’re now in thick fog off Tatoosh Island, and southerly winds are generating a tight chop on the bow. A salmon fishing opening is in effect–we’re seeing a lot more traffic than on our previous run to the Columbia River. 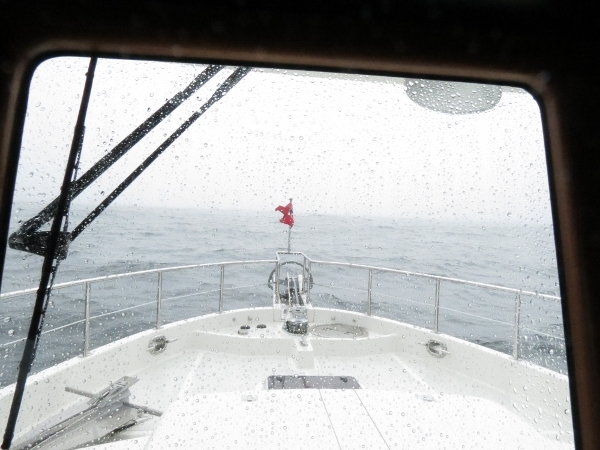 Conditions settled a bit, but now we’re in S 15-knot winds with tight 4-6′ seas on the bow. We’ve got gale-force winds predicted for Mon-Wed, so its definately going to get worse. We’re past the Columbia River bar–this is the southnernmost we’ve ever been with Dirona. Winds have been steady 15, but its been doing that for days, so waves are pretty close together. There’s a gale coming with winds up to 35 knots and 14-foot seas. The conditions are predicted to be better close to shore, so we’ve hading that way now and will continue that distance from shore down the coast. Heading towards shore also lets us run diagonaly across the short swell, which is both more comfortable and much faster. 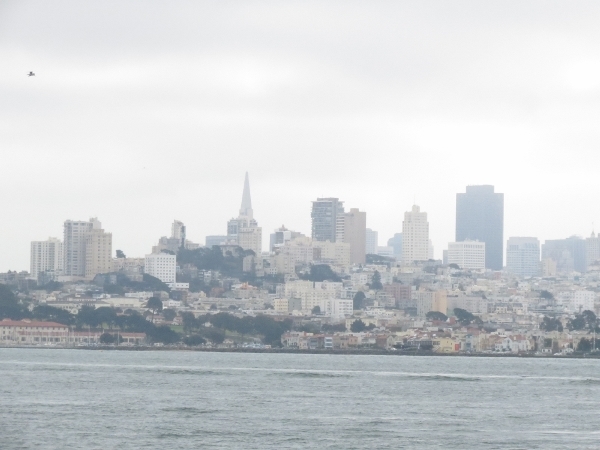 We’re just over halfway to San Franciso now–we’ve got 365 mile left out of 837. 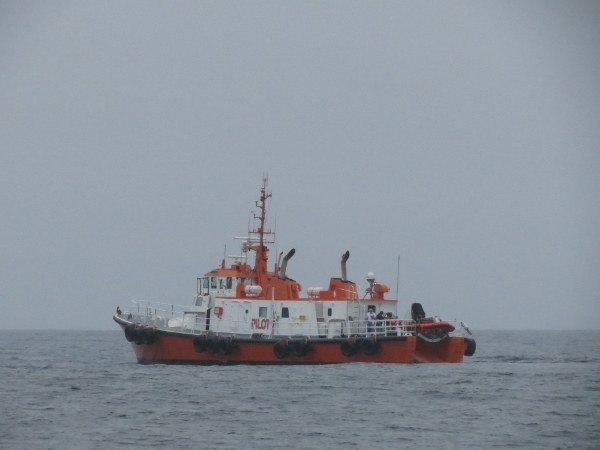 Conditions are exellent now–calm seas and we’re making great time compared to bow-into the waves yesterday. The weather prediction for within 10 of shore has worsened, but still is better than offshore. The bad weather has arrived. 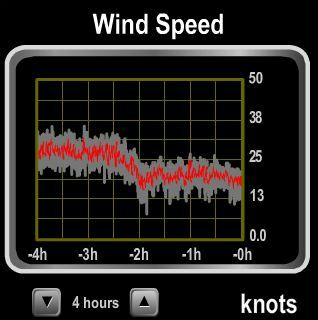 Winds are N 25-30, generating tight 7-9′ seas. The only good thing as that we are running with the waves, rather than against them, so we’re still able to make decent time. Conditions are expected to worsen, with 10-12′ seas tonight, and then start to ease off tomorrow morning. Winds are steady 30 with 10-12′ seas. 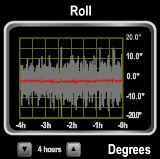 The range in the roll guage pictured is from -20 to +20 in 5-degree increments. Even with hydraulic stablizers running at maximum output, we’re still rolling 15 degrees each side. Conditions much improved. 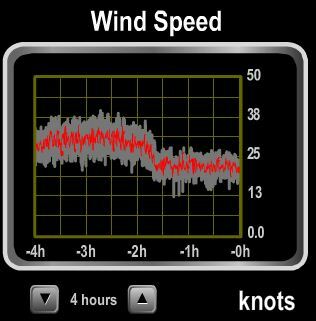 The wind has dropped to 10-20 knots and the waves to 7-9′. The waves still are big, but aren’t nearly as fierce as a couple of hours ago. 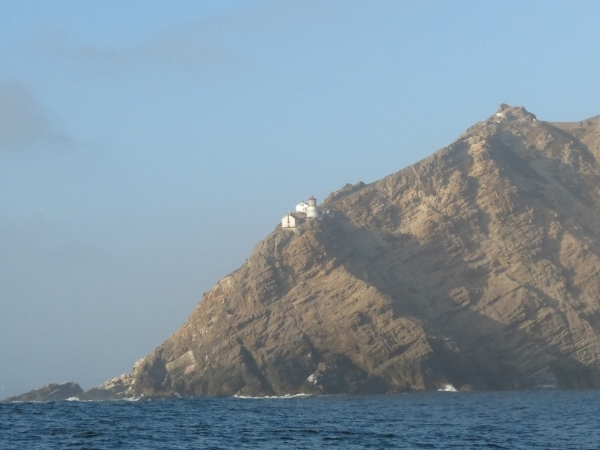 Conditions were reasonable rounding Cape Menocino, but worsened not far south. 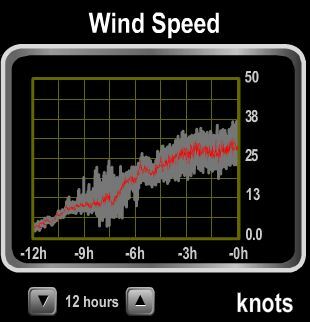 Winds blew 30-knots most of the graveyard shift, with 10-12′ seas to match. The wind has again settled back down into the 20s, with mostly 7-9′ seas again. The sun just rose on what promises to be a good running day: winds are down to around 10 knots, the waves are 5-6′, and the sky is clear and blue. The clear skies gave way to a thick fog late this morning. Winds are blowing around 10 from the SW–not much of a problem except we’re getting a good saltwater bath from the spray. Our ETA to Golden Gate is the middle of the night, so we’re thinking of stopping in Drakes Bay tonight and proceeding through Golden Gate tomorrow morning. Hopefully the fog will lift and we’ll actually be able to see the bridge. The lighthouse at Pt Reyes, hung of the cliff, makes a dramatic display. Land actually has been ho for a while, but this particular land is more interesting to us because we plan to anchor at Drakes Bay for the night. The engines are off after four days straight, the anchor is down, and the wine is poured. Time for a relaxing meal and a full night’s sleep. For our first California anchorage, it’s a pretty nice one. Steep hills are on three sides and we have a clear view south towards San Francicso. Got up just before sunrise and we’re all excited to be heading towards the Golden Gate Bridge (even Spitfire). We’re in the lanes with the Golden Gate Bridge just visible in the distance. Conditions are overcost, but not socked in. 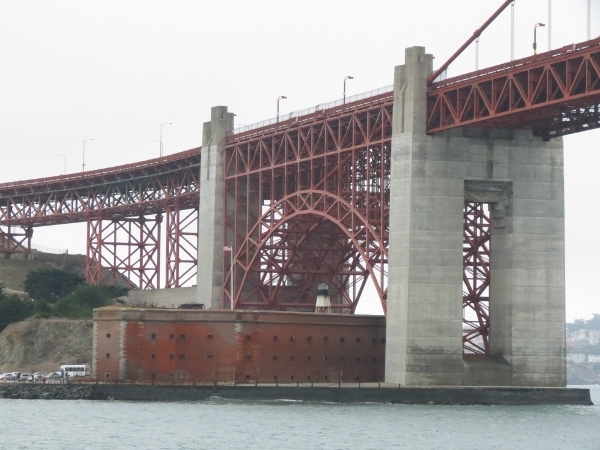 Masonry fort under the south end of the Golden Gate Bridge. Lunch on deck in our new temporary home. 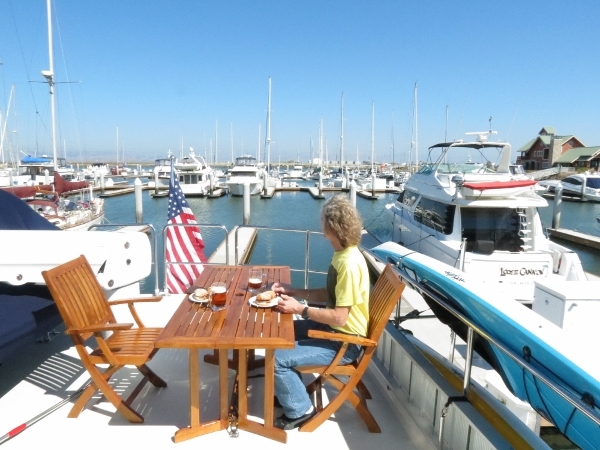 Westpoint Harbor Marina is an impressive new facility with excellent services.